To run the example, open the chatclient.html file in a browser. After login, the client can invoke the method sendMessage and receive the signal newMessage to send and receive messages. Furthermore, a userList property provides the names of all other connected clients. The list is automatically updated when its contents change. Also, the client responds to the server's keep alive signal which is needed to detect disconnected clients and remove them from the userList property. 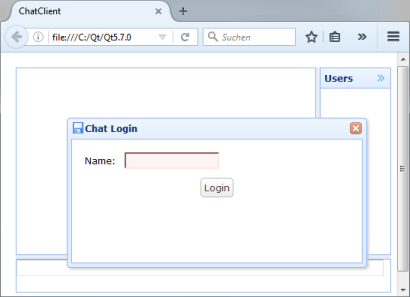 The client is able to work with Qt WebChannel ChatServer Example. See also Qt WebChannel ChatServer Example and Qt WebChannel ChatClient QML Example.